The new Laguindingan Airport is not in Cagayan de Oro City unlike the old Lumbia Airport which it replaced. In fact, it's west of CDO where you need to budget at least an hour travel time to/from the airport. Here's a guide how to get to Laguindingan Airport from Cagayan de Oro and vice versa. 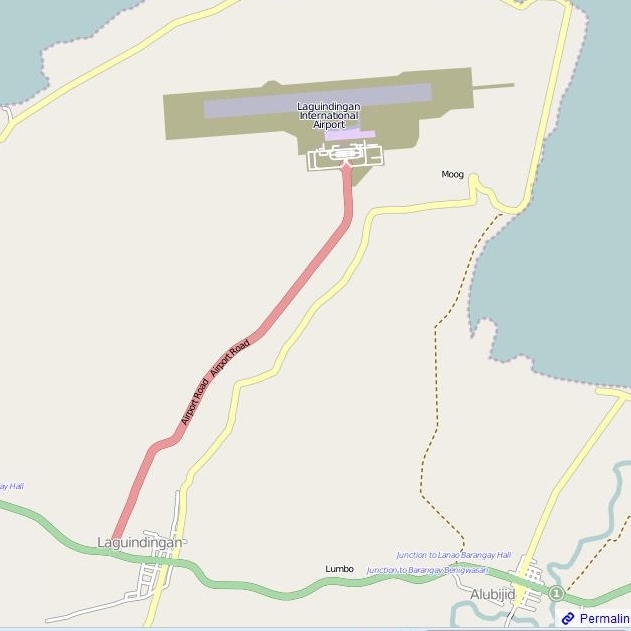 Map of Laguindingan Airport (via OpenStreetMap) showing the neighboring town of Alubijid. Going right (east-bound) is Cagayan de Oro, while to the left (west-bound) is Iligan City. going to Centrio Mall on Corrales Street via Laguindingan Airport Express or via Magnum Express to/from Bulua Terminal. There are also vans inside CDO city proper going to the new airport particularly in the Divisoria and SM City Cagayan de Oro area. you about PhP1,500.00 one way instead of using the meter. ths information was provided by Tutubi's friend who now lives in CDO. How Tutubi wishes to escape from the grit and grime of Metro Manila and live elsewhere.